Guide showing you how to customize the ForgeRock Access Management user interface. This guide covers concepts, configuration, and usage procedures for customizing the ForgeRock Access Management user interface. This guide is written for anyone wanting to apply their own look and feel to the end-user facing pages provided by ForgeRock Access Management. When you deploy OpenAM to protect your web-based applications, users can be redirected to OpenAM pages for login and logout. 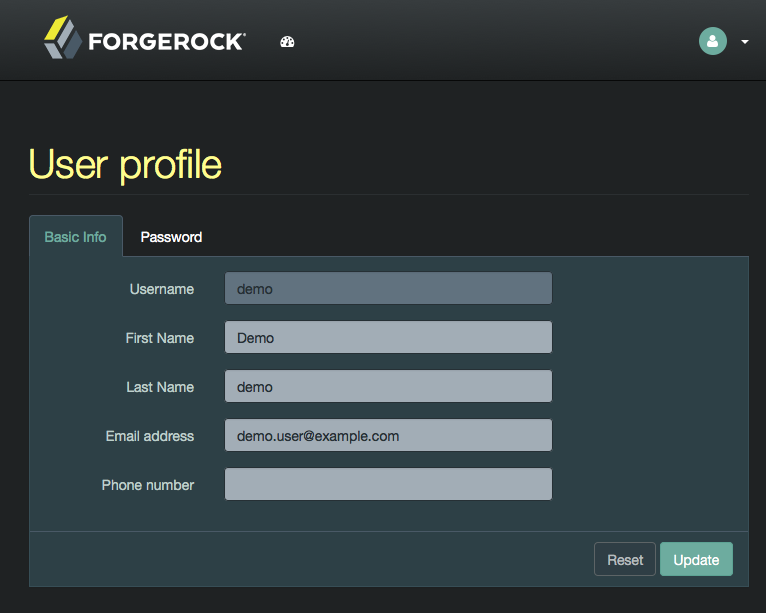 The end user pages have ForgeRock styling and branding by default. You likely want to change at least the images to reflect your organization. You might want different customizations for different realms. This chapter addresses how to get started customizing OpenAM end user pages for your organizations and supported locales. You may want to change the default styling and branding as well as customize different realms. 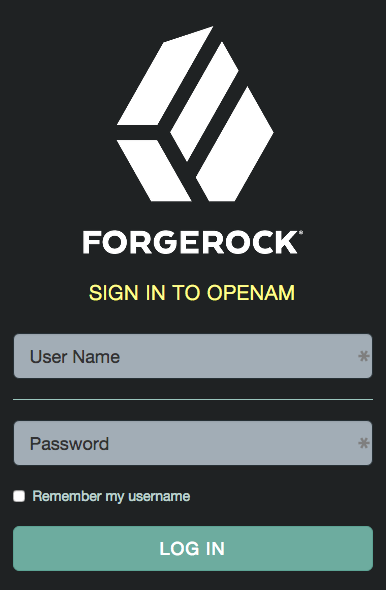 While customizing the UI, you can set the advanced server property, org.forgerock.openam.core.resource.lookup.cache.enabled, to false to allow OpenAM immediately to pick up changes to the files as you customize them. This includes the XML callback files for authentication modules used by the XUI. You can set advanced server properties in the AM console under Deployment > Servers > Server Name > Advanced. Before using OpenAM in production, set org.forgerock.openam.core.resource.lookup.cache.enabled back to the default setting, true. This chapter covers customizing the default user interface, known as the XUI. This section explains how to use themes to alter the appearance of user-facing XUI pages. The XUI is built with the Bootstrap framework, and supports Bootstrap themes to customize the look and feel of the user interface. Only user-facing XUI pages support themes. The OpenAM administration console cannot be themed. You can apply themes to specific realms, and also to specific authentication chains within those realms. OpenAM includes a default theme, and an inverted dark theme. This procedure demonstrates adding a custom Bootstrap theme to the XUI. 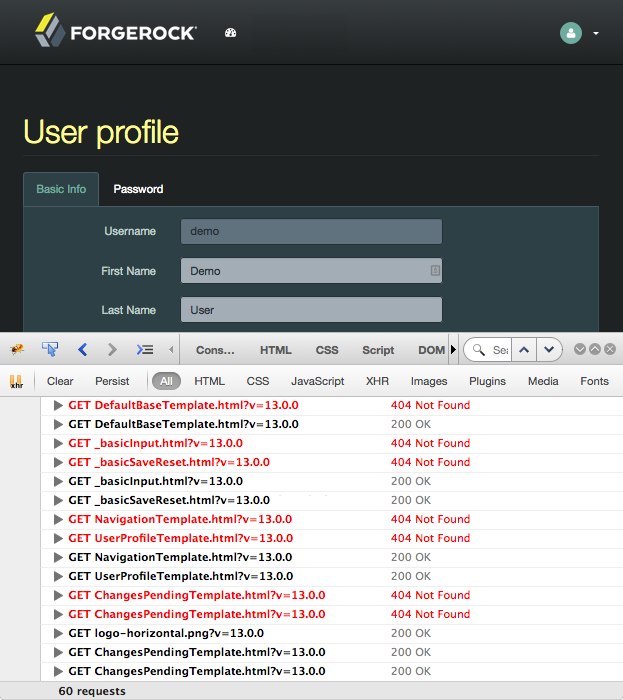 Copy your custom Bootstrap theme to a directory in /path/to/tomcat/webapps/openam/XUI/themes/. A custom Bootstrap theme should consist of one or more CSS files, and optionally media and font files. As an example, the dark theme is available in: /path/to/tomcat/webapps/openam/XUI/themes/dark/. // There must be a theme named "default". In the new theme element, create a stylesheets array containing the theme's two CSS files, followed by the required css/structure.css file. Note that you must specify paths relative to the XUI directory. If required, specify additional settings specific to the new theme, such as the logos to use or the footer information. For information on the available settings, see Section 3.2, "XUI Configuration Parameters". Locate the mappings array, and create a new element under it to map your new theme to realms and authentication chains. Elements in the mappings array are evaluated in order from top to bottom. The first theme that matches the current realm and/or authentication chain is applied. Any subsequent mappings, even if true, are ignored once a match is found. If no match is found, the default theme is applied. You can use a regular expression to specify the realms the theme should apply to. For example /^\/a/ will apply the theme to all realms that start with /a, including /ab and /a/c. If you do not include a realms array, the theme is applied to all realms. If you specify both realms and authentication chains, the theme is only applied when both criteria are true. This section explains how to alter the layout of end user-facing XUI pages. XUI pages are built with HTML templates, which in turn may contain reusable snippets of HTML stored in files referred to as partials. The XUI stores the default templates in /path/to/tomcat/webapps/openam/XUI/templates and the default partials in /path/to/tomcat/webapps/openam/XUI/partials. You can override some, or all of these files by making duplicates containing edits and instructing the XUI to use the duplicates in place of the defaults. To avoid HTTP 404 Not Found errors when customizing XUI layouts, duplicate the entire /XUI/templates and /XUI/partials directories into your custom theme directory, rather than only copying files that will be edited. This procedure demonstrates customizing the default XUI layout by overriding a partial file. Copy the directories containing the templates and partials you want to customize to a directory in /path/to/tomcat/webapps/openam/XUI/themes/, ensuring that you maintain the same directory structure. Edit the copied template or partial files with the changes you require. Edit the /path/to/tomcat/webapps/openam/XUI/config/ThemeConfiguration.js file, and add a path element that points to the newly edited templates or partials within the theme they will apply to. Note that the trailing slash in the path value is required. This section explains how to localize the text that is generated for the user-facing XUI pages. The text the XUI displays comes from from translation.json files located in locale-specific directories. To customize the English text, edit /path/to/tomcat/webapps/openam/XUI/locales/en/translation.json under the directory where OpenAM is deployed. To prepare a translation for a new locale, copy the provided /path/to/tomcat/webapps/openam/XUI/locales/en directory to /path/to/tomcat/webapps/openam/XUI/locales/locale, and edit the duplicate by changing the values, and taking care not to change the JSON structure or to render it invalid. The locale should be specified as per rfc5646 - Tags for Identifying Languages. For example, en-GB. This reference chapter covers the languages and locales supported by OpenAM, as well as configuration parameters for OpenAM's user interface, named the XUI. This section lists languages and locales supported for OpenAM. You can localize the XUI for other languages as you require. For more information, see Section 2.3, "Localizing the XUI". The configuration of the XUI is based on settings in the ThemeConfiguration.js file. This file can be found in the /path/to/webapps/openam/XUI/config/ directory. The file contains a full configuration for the mandatory default theme. Additional themes should use a duplicate of the default theme's configuration. Any parameters that are not configured will inherit values from the mandatory default theme. themes: Title; also represents an array of theme objects. stylesheets: An ordered array of URLs to CSS stylesheet files that are applied to every page. It is highly recommended to include "css/structure.css" as one of the entries to provide default styles for layout and structure. path: A relative path to a directory containing templates or partials directories, used for customizing the default layout of XUI pages. For more information, see Section 2.2, "Customizing XUI Layout". icon: URL to a resource to use as a favicon. settings: Configuration settings for the theme. Missing parameters inherit their value from the mandatory default theme. logo: Parameters for the logo displayed on user profile pages. src: Filename of the logo. title: HTML title attribute of the logo. alt: HTML alt attribute of the logo. height: Logo height in CSS notation. For example: 75px or 10%. width: Logo width in CSS notation. For example: 150px or 25%. loginLogo: Parameters for the logo displayed on login pages. footer: Parameters to display in the footer of each XUI page. For more information, see Section 2.1, "Theming the XUI".